Provinces, SANA – The army units, backed by the Air Force, are making sweeping advances in various provinces across the country, establishing control over more areas, in addition to launching an operation in Homs province. A military operation against Takfiri terrorist organizations in the northern and northeastern countryside of the central province of Homs started Thursday morning and resulted during its first hours in establishing full control over al-Khaldiyeh village. A military source told SANA that the army operation started following intensive bombardment by the Air Force and Artillery on the terrorist organizations’ positions and headquarters. Full control was established over al-Khaldiyeh village near al-Dar al-Kabeera town in the northwestern countryside of the province, after eliminating a number of terrorists and destroying their weapons, according to the source. The army units destroy two operations rooms for terrorists in Talbiseh and Teirmaala in the northern countryside. Meanwhile, terrorist organizations acknowledged the death of a the leader Teirmaala operations room, the terrorist Rawad al-Aksah and another leader named Amer Moussa Shiblout. Many terrorists were killed as teh army targeted their positions in al-Ghanto and Ghajar Amir, north of Homs city. Local sources in the area reported collective fleeing by members of the terrorist organizations from al-Masharie area near Qan al-Assi in Teirmaala area towards Talbiseh and al-Rastan. Meanwhile, the terrorist organization of “Jabhat al-Nusra” perpetrated at 07:00 this morning a massacre against the innocent civilians in Teirmaala Square near the town’s Mosque, with the aim of accusing the Syrian Army and Russian Air Force of targeting civilians. The military source reported that the Syrian Defense Ministry stressed that the Syrian Arab Army and the Russian Air Force do not target civilian-populated areas, holding Jabhat al-Nusra terrorist organization and its partners fully responsible for the attacks. 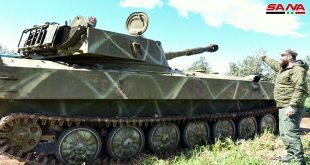 An army unit also destroyed a vehicle equipped with heavy machinegun with all terrorists aboard in al-Dar al-Kabira in the northern countryside of Homs. The army launched special strikes against terrorists’ dens and gatherings in al-Kaban and al -Mashjar al-Janobi neighborhood in Talbeisa area. The strikes destroyed a rocket launcher and headquarter of terrorists’ leaders. 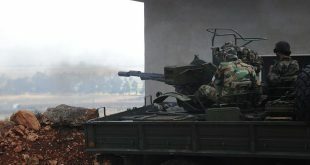 An army unit destroyed a vehicle equipped with a heavy machinegun with all the terrorists inside it in al-Dar al-Kabira in the northern countryside of Homs. The Army launched concentrated strikes against terrorists’ dens and gatherings in al-Kaban and al-Mashjar al-Janobi neighborhood in Talbeisa area. The strikes destroyed a rocket launcher and a headquarter for terrorists’ leaders. 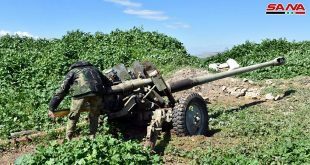 countryside that extends between Hama and Idleb provinces were eliminated during the continued military operation which was carried out by the Syrian Army with a cover of the Air Force. The army units continued their war against terrorism and achieved a great progress in defeating terrorist organizations. 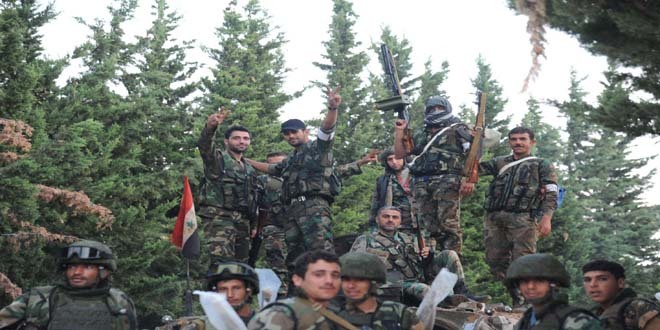 The units established full control over Foro and al-safsafeh in the north western countryside of Hama after eliminating the last dens of terrorists and destroying their arms and ammunition. In the meantime, an army unit killed all members of a terrorist group in al-Sirmaniyeh village in Hama province. The army units established control over Naam village and Naam hill in al-Sfeireh area in the eastern countryside of the northern Aleppo province. province, after eliminating terrorists’ hotbeds. The source added that the army units established full control over a number of significant sites and points northeast of al-Sheikh Miskeen village, about 22 km north of Daraa city. The source added that a number of Jabhat al-Nusra terrorists were killed in the army operation and their vehicles and equipment were destroyed. Meanwhile, the terrorist organizations acknowledged on their social media websites the killing of a number of their members, among them terrorists Basel Khairo al-Jawaberah, Kaser Median al-jinadi, Jarrah Naser abu Halaweh and Hamzeh Ghassan al-Hariri. Units of the army advanced in the northern farms of Harasta in Damascus countryside, establishing control on parts of the military installations after eliminating a number of “Jaish al-Islam” terrorists, among them Khaled al-Da’as and Adnan Issa. The army also destroyed a den for terrorists in al-Ajami neighborhood, killing a number of the extremist organization; among them were Ibrahim Tabbawi and Ahmad Hammoud. In Erbin and Zamalka, units of the army destroyed a depot and killed Jordanian terrorists Ayoub al-darawsheh and Mosaed Ali al-Tawalaa in addition to terrorists Hashem al-Khateeb and Hussein Abdullatif in special strikes against Jaish al-Islam. Later, a military source told SANA that the army, after establishing control on Rima Company in al-Majbal in Harasta, achieved more progress and established control on 15 buildings after eliminating a number of terrorists. An army unit, in cooperation with the popular defense groups, established control over al-Amal farms in the northern countryside of the southern Quneitra province. The military source said all the hideouts and fortifications of Jabhat al-Nusra terrorists, who are linked to the Israeli enemy, were destroyed in the area, with many of them left dead or wounded. The source added that full control was established over the site of al-Amal checkpoint, which separates al-Amal farms from Trinjeh village, which is used by terrorists as a springboard to carry out attacks and fire rockets at safe villages. Today’s achievement came two days after the army established control over the strategic Ahmar (hill) in Quneitra countryside. Meanwhile, the terrorist organizations acknowledged on their social media pages that a number of their members, including the leader of the so-called “Aqraba Martyrs Battalion”, who is named Mohammad Marwan al-Sabti.